Garland Lights are a beautiful and unexpected way to light up your holidays and events. From fairy cluster lights used to light up centerpieces and Christmas decor, to garland lights used to hang on your porch or wrap a banister or column. Decorating with these gleaming lights will be something that everyone will remember for a lifetime. 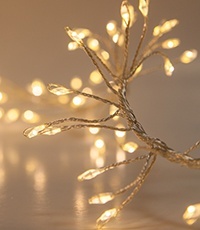 Garland lights are perfect for decorating for holidays, events, weddings, and much more! With these lights and a little imagination, you can create something beautiful. There are a few different types of garland lights, we've outlined the differences between each below. LED Fairy Garland Cluster Lights are the perfect size to illuminate unlit garland, Christmas decorations, holiday centerpieces, and other decor! Each string has four hundred gorgeous LED fairy lights that are energy efficient and durable for all your decorating tasks. These lights are extremely easy to decorate with and remain cool to the touch. With multiple colors to choose from, we are certain you will find the perfect color to fit every occasion. 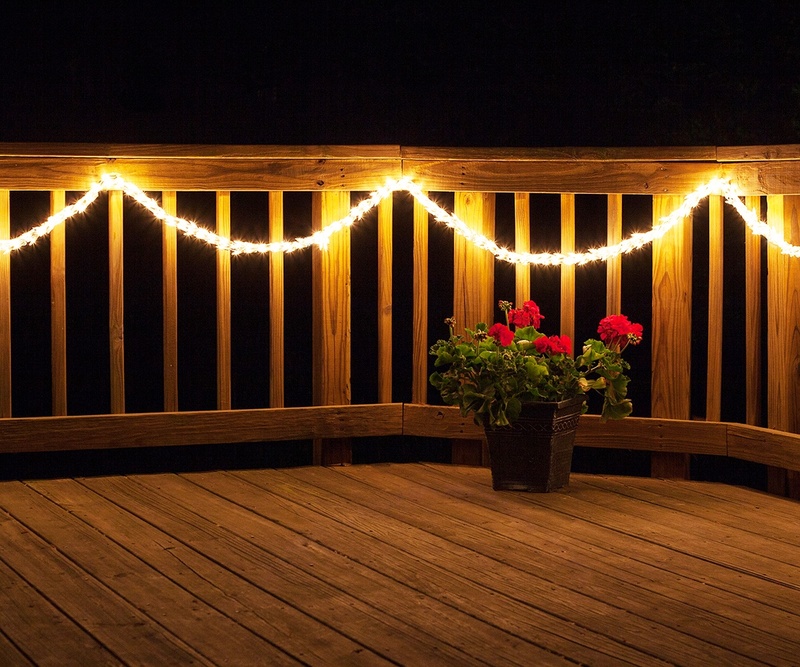 Incandescent Mini Garland Lights are strings of mini lights wrapped together to create a glowing garland. The strings contain hundreds of mini lights that create a shining appearance that will grab everyone's attention at all your occasions! Having many colors such as, clear, multicolor, and themed combinations, provides you with plenty of options for choosing the best garland to decorate your events. Garland lights are a fast and beautiful way to decorate. Garland lights are available in multicolor, themed, and cool or warm white tones, allowing you to decorate completely to your preference. Decorating with multicolor lights creates a joyful scene and a sense of happiness in any space. On the other hand, warm white LED lights provide a cozy and sophisticated glow that many people adore. Cool white lights are a stark contrast to warm white with their icy bright glow that's perfect for pairing with solid colors. Bringing colorful and white lights together can create a magnificent display when they are used in moderation. 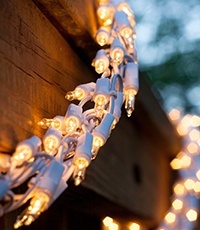 Take a creative leap by outlining your house in multicolor bulbs and then using white garland lights only on your porch. You could also fill clean candle lanterns with a combination of red and green or red and white fairy garland lights for a pop of Christmas color! Red/Green - Perfect for complementing your house during Christmas. Amber Lights on Black Wire - This Halloween garland will give your house a spooky and mystical atmosphere. Red/White - Decorating your house for Christmas, 4th of July, or Valentine's Day can be done entirely with this one striking garland set. 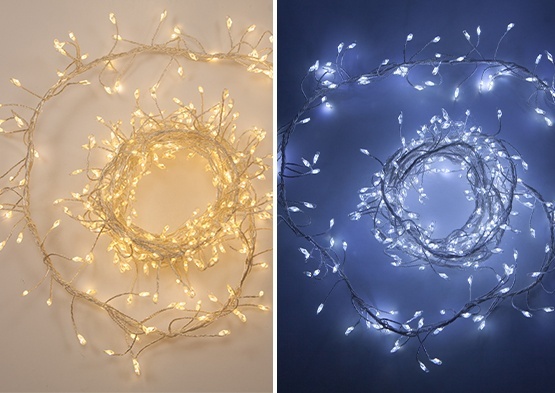 Garland lights can be used to decorate holidays, weddings, showers, or just to add some ambient light to your house! Use themed garland lights to decorate for holidays such as Christmas, Halloween, and Thanksgiving. You can also create your own themed lights by combining different colors of fairy garland! Below are some decorating ideas to spark your imagination. DIY Project: Thread fairy garland lights through an unlit garland or wreath to make your decorations glow. Decorate centerpieces and tables with fairy light garlands. Wrap small trees with garland lights and add small ornaments or decor for a final touch. Fill clean candle lanterns or other decorative items with fairy light garlands for a festive pop of color and light anywhere. Wrap your banister, porch railings or columns with garland lights during holidays and events. 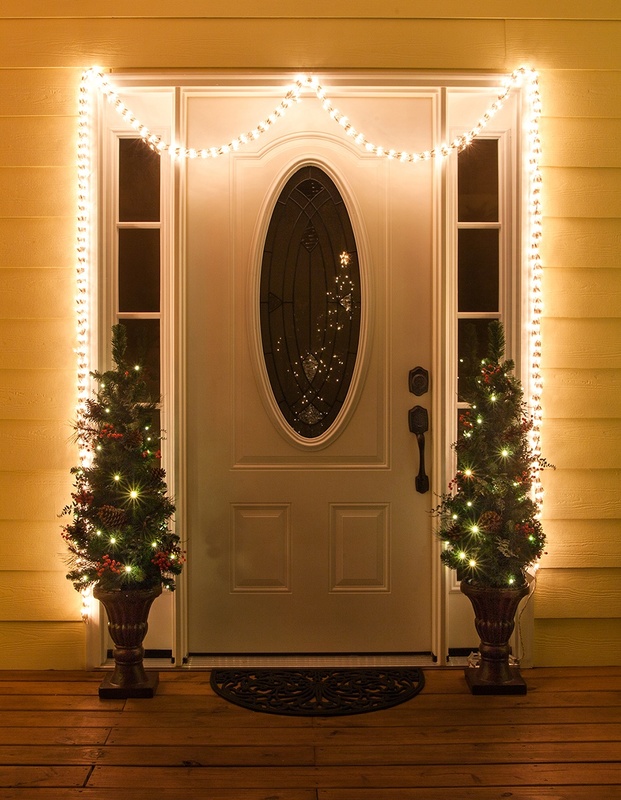 Hang garland lights around your front door to add some sparkle to your entryway. Take yourd design one step further by placing small potted trees on each side of your door for a welcoming holiday porch scene. Hang warm white garland light across a ceiling with sheer fabric for a stunning wedding decoration.